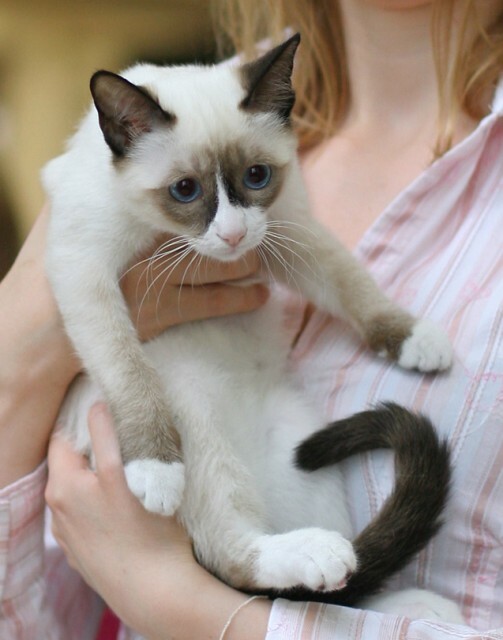 The Snowshoe, which has a Siamese point pattern with very precise white markings, presents an extreme challenge for breeders. The Snowshoe breed was established by Dorothy Hinds-Daugherty and further developed by Vikki Olander, using Siamese and bicolour American Shorthair cats. This combination produced kittens with the typical darker Siamese markings on their faces, ears, legs, and tail, but also snowy white boots and mittens, and an inverted white V on the face. The Snowshoe was initially accepted as an experimental breed by the American Cat Association (ACA) and the Cat Fanciers Federation (CFF) in 1974, but there was little interest at the time and Olander remained the only U.S. breeder for several years. The Snowshoe had nearly become extinct by the time other breeders eventually took an interest in the breed. The Snowshoe breed has now been accepted for Championship status by most major cat organizations, including the Cat Fanciers Federation, the American Cat Fanciers Association (ACFA), and The International Cat Association (TICA). However, the Canadian Cat Association (CCA) and the Cat Fanciers’ Association (CFA) have not yet accepted the breed, as there are insufficient numbers of Snowshoe breeders and cats. The Snowshoe’s popularity and population have both been rising in recent years, and breeders continue to work toward a more uniform appearance, larger size, and deeper eye colour. Achieving a standardized appearance has proven challenging in a cat that has so many different genetic elements to control. The Snowshoe face shape is somewhere between that of a Traditional Siamese and an American Shorthair. Ears are medium to large and broad at their bases, with the tips slightly rounded. The blue eyes are walnut-shaped and slanted. The Snowshoe’s body has the solidity of the American Shorthair combined with the elongation of the Siamese. The adult male Snowshoe weighs typically weights 8-14 pounds and females are 6-12 pounds, with a finer bone structure. The Snowshoe has a short coat with a Siamese point pattern. Points may be blue, chocolate, cinnamon, cream, fawn, lilac, red, or seal, though many associations only accept blue and seal point. The preferred pattern is a symmetrical inverted V on the face and white boots and mittens, though many Snowshoes have a white moustache or blaze rather than a V, as well as additional patches of white on their bodies. The white spotting factor (also known as the piebald pattern) presents a significant challenge for breeders. It’s difficult to regulate the gene that creates this pattern, so many Snowshoes have too much or too little white, or white in the wrong places, because they have inherited two copies of the dominant gene that governs white spotting. These cats are sold as pet quality rather than show quality. Only TICA allows cats with a higher percentage of white and a more varied pattern overall to be shown as Snowshoes. Snowshoes may be outcrossed with American Shorthairs, Oriental Shorthairs, and Siamese cats. Traditional (Applehead) Siamese are preferred to the modern Extreme type, which has a sharply angled face and very lean body. Today, American Shorthairs are rarely used in Showshoe breeding programs. Contrary to popular misconceptions, the Snowshoe is not a shorthaired Birman variant, nor have Snowshoes been crossed with Ragdolls or Birmans. Rarely standoffish or aloof, the Snowshoe loves to touch and be touched. Snowshoes tend to be underfoot a lot and most are lap cats. This is not a breed that can be left alone for long periods of time. If adopting a snowshoe, obtaining a second (compatible) cat at the same time is recommended so that they can keep one another company. Fanciers assert that Snowshoe cats believe they’re people rather than pets. Most are good with children and other pets, as long as the introductions are handled appropriately. Although they are affectionate with their families, Snowshoes may be timid with outsiders and slow to accept strangers. Snowshoes are energetic, but not at all high-strung. The more laid-back American Shorthair temperament creates a pleasing balance between Siamese hyperactivity and docility. Snowshoes have inherited the intelligence of their Siamese cousins and many can learn to do tricks. Most figure out how to open doors, cabinets, and in some cases even refrigerators. They are also inclined to carry objects around in their mouths, which in some cases are regularly deposited into their water dishes. A fascination with water is common with this breed. Many Snowshoes will play with running water, and some will even jump into the bathtub with their owners, though they are less inclined to appreciate a bath when it’s not their choice. Snowshoes are chatty like their Siamese relatives, but they are not as loud or as frequently vocal. There are no health problems specifically associated with the Snowshoe. This is unsurprising, given that Siamese cats are known for their impressive longevity, and the American shorthair is a healthy, hardy breed. The average price of Snowshoe kittens is around $500 and up, though pet quality kittens may sometimes be obtained for a lower cost. Adult Snowshoe cats can be obtained from rescue organizations. See the Snowshoe Cat Rescue page and Petfinder’s list of adoptable Showshoe cats to adopt an adult Snowshoe. Animal Planet. (2009). “Snowshoe.” Animal.Discovery.com. P&G Pet Care. (2009). “Snowshoe.” Iams.com. I read someplace that you should NOT free feed a Snowshoe Cat (She’s 2 h Is this true? Approximately one-third of cats that are free fed become obese over time. I haven’t heard or read anything about not free feeding Snowshoe cats specifically, but free feeding is risky in general because of the increased likelihood of overeating and the resulting health problems. I wouldn’t recommend free feeding for most cats (the exceptions are cats that tend to be underweight and need to eat more). I’m looking into getting a snowshoe kitten but I don’t know what price I should be paying for one ?! Where do you live? I am in Mississippi and purchased one for $125. That is without papers. The mother and father of my kitten are gorgeous snowshoes!! Email me and I will give more info. I have a 18 mo. old perfect snowshoe female who my vet ok’D for breeding 6 mo. ago but finding a male in Washington State or Oregon. She is too perfect not to breed but can’t continue in perpetual “heat”. None who knows or has a male. Please contact at Gmail or Catster. I had a Snowshoe for 18 years. He was such a good behaved loving cat. The best pet I’ve ever owned. We did everything together. He even loved car rides and would just sit on my lap as I drove. He slept with me every night holding my neck with his little paws. I miss him so so much. Beautiful blue eyes but he was cross eyed which I heard is pretty common for this breed and was petite in size. I would do everything to bring him back. im looking for a snowshoe cat! I live in Albuquerque NM, and here there are really rear… is there anyway you know where I can find a snowshoe cat in Albuquerque nm. I’ve got an 8- month old female Snowshoe who’s in heat, again. Poor thing. I’m looking for a STUD for her to mate with but haven’t found him, yet. I’m in UT. If anyone knows where to find one please get back to me!